If you are someone who appreciates a properly detailed vehicle, you probably have a need for cleanliness in many aspects of your life, including your garage. I generally try to keep a neat and tidy workspace that is free of clutter and well organized, however having recently made the transition from having a stand alone detailing shop to an unfinished garage, I’ve found it challenging at times. With my limited space, I’ve found that I like to have as many things hanging up on the walls and out of the way as possible. 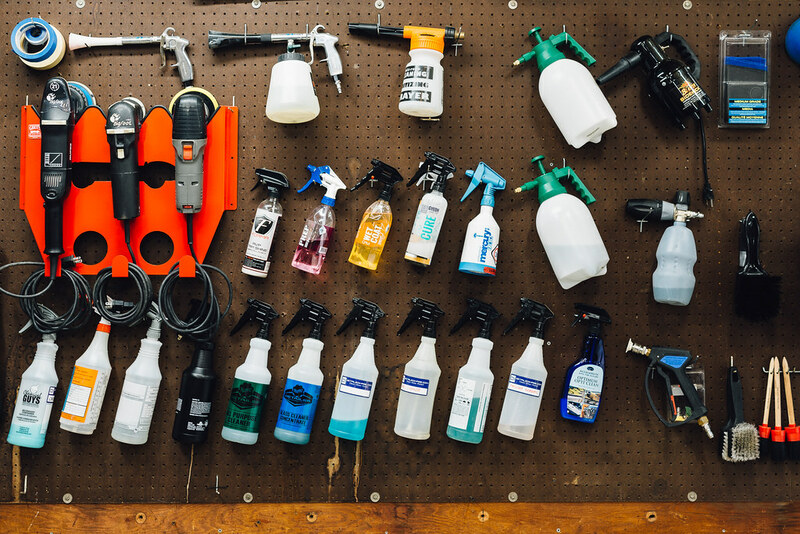 My spray bottles hang on a peg board, my pads and towels are stored in cabinets and are categorized by type, but my polishers have never really had a home. I generally store my machines on top of a cart or shelf, which is not a bad place for them to be, but it just isn’t as tidy as I’d like and it takes up valuable floorspace. The Griot’s Garage Polisher Rack solves this problem by enabling me to hang my machines on the wall where they are out of the way and nicely displayed. 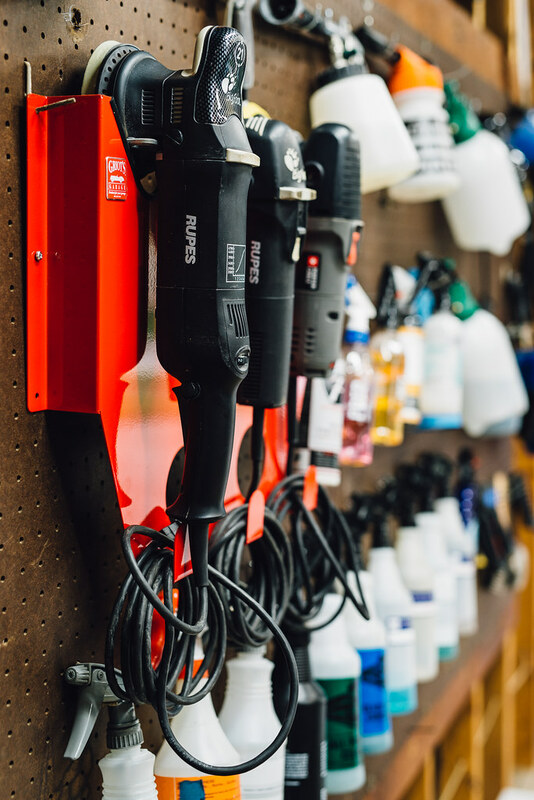 The Griot’s Garage Polisher rack can hold up to five machines at once. There is space for three larger machines and two smaller machines. The hooks beneath the machine mounting locations are for the cords. The top edge of the rack has a rubber edge for your polishers to rest on, which is a really nice touch, however the two lower mounts do not have the same type of edge guard. The rack measures 16 1/2″ tall x 21″ wide x 3 3/4″ deep and is made of 16 gauge steel. It feels very sturdy and well made. The face of the rack has the Griot’s Garage Car Logo cut out, which looks nice, but it is mostly covered when you have machines hanging up. There are six holes for mounting the rack, three along each of the vertical sides, so you can be sure it won’t fall off of the wall when properly installed (mounting hardware is included). I did notice that the holes are not spaced such that both sides can contact a wall stud, therefore wall anchors may be required depending on your mounting location. At the end of the day, there is not much more to say about this simple tool other than it is an attractive addition to any workspace and it feels like it will hold up to many, many years of use. It is a nice polisher rack. Was the griot’s emblem a little uneven? Mine was and I have seen others mention the same thing. I can’t say I noticed that, but the emblem has been covered up for all but about 60 seconds since I took it out of the box. I bought one about six months ago and love it. Much cheaper than other options. I’ve got to either get another or find other options. The holes on the bottom are ok for the Rupes Nano or a Griots 3 inch, but not good for much else. I have 3 Rupes 15s, Rupes 21, Rupes Mini, 2 Rupes Nanos, Rupes 19e, and a Porter Cable, I need more space! I need to get one of these bad boys someday. I’m thinking about mounting it inside my van, are the polishers pretty secure when on the rack? I broke down and got one to hold 4 DA’s. It’s solid, makes it easy to organize and quick access.